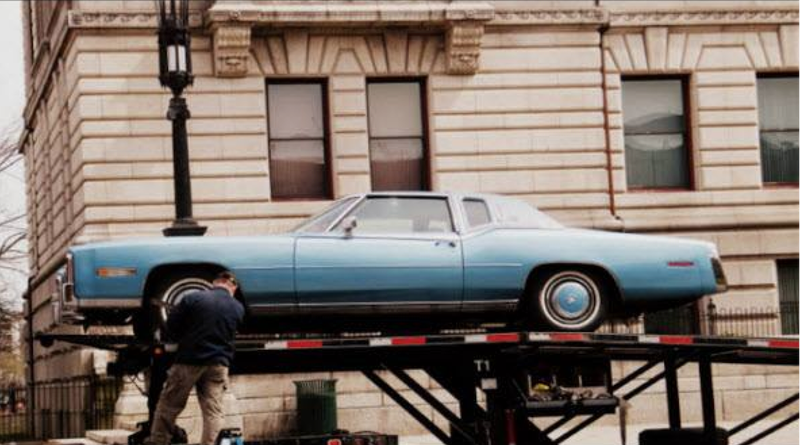 AMERICAN HUSTLE: What’s That Car Irving Rosenfeld Drives? Irving’s actual car being readied for its Hollywood moment. In the movie “American Hustle“, the lead character Irving Rosenfeld (Christian Bale) is seen, at one point, driving out of New York City in a blue beast of a car. What is it? It’s a 1977/78 Cadillac Eldorado Biarritz – one of the last of the Detroit dinosaurs. After the 1978 model year, motorized mammoths of that size were gone – downsized out of existence – victims of rising fuel prices, tightening emissions controls and tougher safety standards. End of an era. As a symbol of 1970s excess, however, the filmmakers could not have selected a finer example than the top-of-the-line Biarritz. These were truly terrible cars, from a performance standpoint. At nearly 5,000 pounds, the Eldo could hardly get out of its own way; if you could get it going faster than 80 m.p.h. (rare), the fans belts would likely vibrate off. They got single-digit fuel mileage and had atrocious reliability records. The base price of the 1978 Cadillac Eldorado was $11,920. The “posh” Biarritz package added $1,865-$3,347, depending on what kind of roof it had on it – hardtop, sunroof or retractable t-top “AstroRoof”. Actually only one AstroRoof model was made (probably just for the auto show it was shown at), so that might be a real collector’s item, if it still exists; American Sunroof Corp. was supposed to make them, but couldn’t ever get them not to leak. I ordered one, Cadillac took my deposit, but it never came. I eventually got a letter of apology (but no refund) from the head of Cadillac division. What’s such a car worth today? According to Hagerty Insurance’s Valuation Tools, depending on condition, they are worth $6,500 for beater-class models to $24,500 for a concours-quality example. But a check of websites such as Hemmings, AutoTrader and Edmunds turns up creampuffs for under $6,000. And I saw a basket case example in a Daytona Beach used car lot for $2,500. Though more than 80,000 were produced in ’77-’78, only a fraction remain on the road; rust was its arch-enemy, and many were crushed, dismantled or sunk for artificial reefs. The 1971-1978 Cadillac Eldorado was basically the same car – with declining performance engineered in. The ’71s started out with enormous 500-cubic-inch engines that made a tolerable 365-horsepower. But with emissions controls that came in the next year, horsepower dropped precipitously – 235 to 210 to 190. For ’77-’78, the 500 c.i.d. engine was replaced by a 425 c.i.d. version that made a puny 180 horsepower. A 195-horsepower version was an option, and – new for 1978! – there was also a disastrous 5.7-liter V-8 diesel that was good for only 120 horsepower – it was quite possibly the worst engine ever to come out of Detroit. Hopefully, Irving did not check that box on his order form. Irving’s Eldo appears to be Medium Blue Firemist on the outside, with matching hubcaps, and a color-coordinated padded vinyl roof (one of the cheesiest options ever) with Landau windows and opera lights. 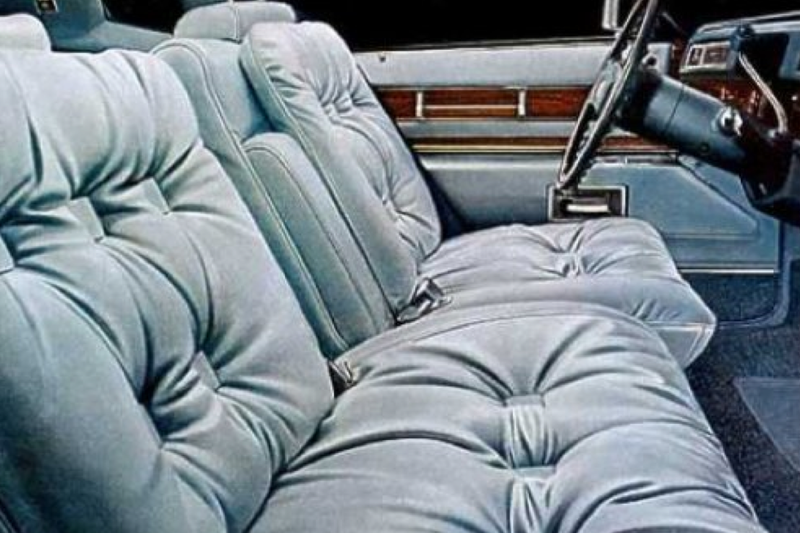 The interior seemed to be a matching blue; tuffed “pillow-top” velour or “Sierra” leather seats were available. Faux wood grain and chromed plastic trimmed the dash. If you are in the market for a car like this, beware of “low mileage” models. Low mileage, for these types of cars may mean the thing was a lemon from the get-go, and never functioned reliably enough to rack up any great number of miles. Of course, conversely, few of them survived long enough to ring up six figures on the odometer. Sort of an automotive Catch-22. « MONUMENTS MEN: George Clooney’s Frank Stokes aka George Stout? I agree with everything you say…but why do I still want one? Hello, the 1978 Eldorado “American Hustle”, V.I.N. : 6L47S8Q237001. They bought for the movie and it is in storage now. Approximate 110,000 miles. Restored once? Replaced: Doors, front fenders. A lot of money spent before I got it. Bought off Ebay out of Illinois?. Second owner neglected it so I bought it to save it. This car needed some common Eldorado parts: “Exhaust Y”, air suspension did not work (silly reason, all there), rear calipers (common). The rest was as you saw except. It had “Appliance aluminum Mag wheels, not the blue hubcaps which were factory appropriate. GREAT CAR, drove as new. A dreamy ride that all cars guys “Love to condemn”! This in fax was my car, bought for the movie. V.I.N. : 6L47S8Q237001. In tact as of this date. In storage in Massachusetts. I do not think thoughts of a sequel, so…now what? Mileage about: 112,000 miles. A lesser restoration done before I bought it. I bought it from a previous (2nd owner) that neglected it locally. I am a Cadillac nut and bought to save it! Broken then: “Y” casting at engine pipe and Air suspension did not work at the time. It also had Appliance aluminum “Mag” wheels on it at the time. The hub capped wheels brought it back to 1978 stock, I love Movies! This car ran his awesome(perfect when I drove it). Brakes sand safety were affirmed for movie use. I had chased down rear calipers that were age ruins when I bought it.